October is Sudden Cardiac Arrest (SCA) Awareness Month! Although SCA awareness is always our objective, every year at this time AED Superstore tries our best to bring SCA awareness to the forefront of the general public. This year we decided to take a slightly different tack and conducted a survey (of more than 6000 people) to garner just what the average person knows about sudden cardiac arrest and how to help. Sudden cardiac arrest strikes more than 300,000 people each year, and sadly, only one out of ten victims survive. Those statistics are grim. Lifestyle, fitness level, and age are not determining factors for those at risk. It can happen to anyone, at any time, anywhere. The only way to improve survival rates is to improve the response by the general public. Our study determined only 6% of respondents would know what to do if faced with a sudden cardiac arrest event. When people get involved, including calling for emergency services, starting CPR, and sending someone for an AED (automated external defibrillator), survival rates can increase from a nearly hopeless 10% to a much more encouraging 38% or better. In fact, using an AED in the first few minutes of an event can increase SCA survival rates by up to 90%. 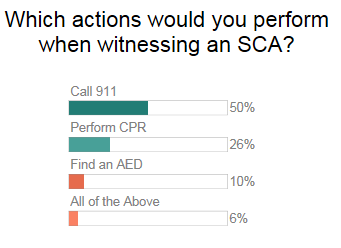 Our study confirms many potential responders hesitate to provide assistance – while 50% of those surveyed would call 911, only 26% would feel comfortable performing CPR and only 10% would use an AED. Some feel reticent to help believing they may cause further injury. The fact is, an SCA victim is technically deceased and will remain so unless steps are taken to keep blood flowing until a defibrillator can be applied. Some bystanders worry about culpability or litigation from the victim or their family. Good Samaritan laws offer legal protection when help is given in good faith, but only 34% of those responding were aware of these protections. If you haven’t had CPR training, you can still help by calling 911, sending someone for an AED, and pushing hard and fast in the center of the victim’s chest until help arrives. We were shocked to find 62% of respondents were unaware AEDs have voice prompts to guide the rescuer and do not shock regular heart rhythms, and when they were asked if knowledge of these contingencies would increase the likelihood they may assist in such a situation, 64% believe they would be more willing to help. Effective CPR and early defibrillation are keys to enhancing the chance of survival for every SCA victim. AEDs can be hard to find, but their numbers are increasing every day – in those surveyed, 64% believe AEDs should be available in their workplaces. There are also apps for smartphones (PulsePoint, AEDRegistry, Atrus’ AED Link, MyHeartMap) which can help locate an AED in the vicinity. EMS dispatchers may be able to help in locating nearby AEDs and may also be able to guide you in performing CPR. Speaking of CPR, yes, it is a good idea to be trained! 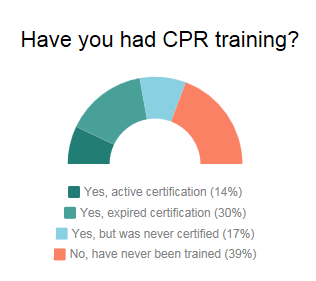 We found 61% of those responding to our survey had CPR training at some point in the past, but only 14% had active CPR certifications (training in the last two years). If you haven’t been trained, you can also just give it your best shot by pushing hard and fast in the center of the chest to the beat of the Bee Gees’ “Stayin’ Alive” or Queen’s “Another One Bites the Dust”. We can all make a difference in the outcome of this indiscriminate killer’s ominous statistics. Do the best you can, but more importantly, do something!